When local restaurant owners of Rosaria’s Italian Restaurant in Kennesaw, Penny and Frank came in to look at granite, they said they wanted to have a “warm, inviting kitchen”. They wanted a kitchen where their friends and family could spend time together. 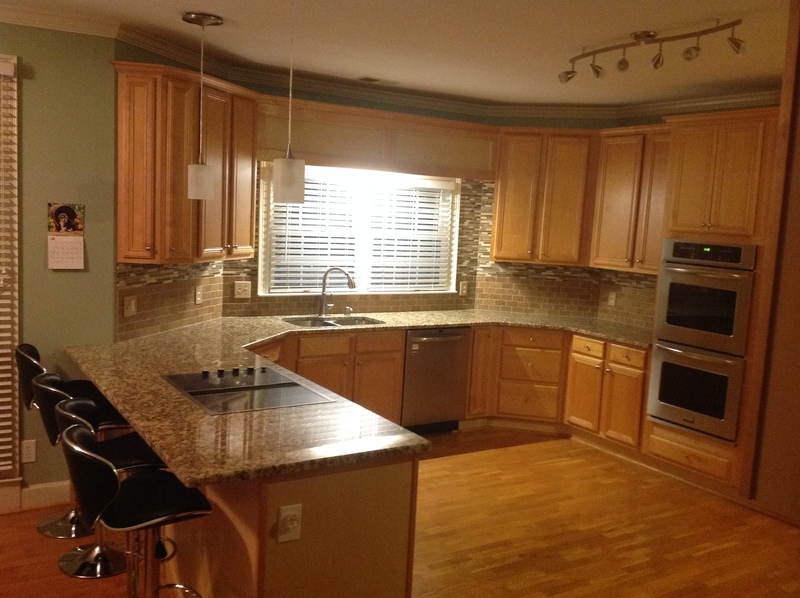 After shopping and talking with many granite countertop companies, they chose us from a recommendation. At Crowe Custom Counters and the Granite Countertop Warehouse, we focus in the design and the understanding that we must deliver a superior product that not only looks great but also complements the existing décor including cabinetry, flooring, lighting, fixtures, walls, appliances etc. Without a focus on design, the fabrication suffers. When we found out that we needed to please the discerning eye of restaurant owners, we knew that we needed to get a design that meets the expectations of food service professionals. We understood that they needed to speak with Lori Sheen. Penny and Frank chose Santa Cecilia Classic with a quarter bevel edge profile because it paired well will the golden oak cabinetry and beautiful hardwood floors. The Santa Cecilia Classic along with the cabinetry and flooring contrasted perfectly with the stainless steel appliances, tile backsplash, fixtures and contemporary lighting. Penny and Frank were very happy with their kitchen and sent us the photos below. You can see how the desired look juxtaposition of new and old was achieved in the before and after pictures. Lori is one of our senior designers that we go to when we have a project that has a particular set of challenges that requires the best. If you would like to speak to Lori with no obligation and get her opinion on a certain project, you can make an appointment with her. Rosaria’s Italian Restaurant is family owned and operated. Originally the family came from Sicily to Chicago, Illinois where they opened their first Italian restaurant in 1969. Over the years they established other restaurants throughout the Chicago area. On October 15, 2002 Rosaria’s Italian & Pizza opened in Kennesaw, Georgia. Great Pride is taken in the preparation of food and only quality ingredients are used to produce authentic homemade Italian cuisine. So when taste matters, come join the family at Rosaria’s for a home cooked meal.